PROTECT ANY ELECTRONIC DEVICE FROM POWER SURGES & SPIKES: White surge protector with six outlets protects your PC, personal computer, laptop, printer, scanner, router, phone, fax, modem, television, lamp or any other home/office electronics from dangerous power surges, spikes & line noise. PREMIUM SURGE PROTECTION WITH METAL HOUSING: This white surge suppressor provides six widely spaced NEMA 5-15R outlets which are arranged in 3 exclusive isolated filter banks to limit noise interaction among connected equipment. The extra-long 6-foot AC power cord acts like an extension cord to give you the flexibility to reach distant outlets, while its right-angle NEMA 5-15P flat plug allows furniture and equipment to be moved flush against the wall to save space. SAFETY FIRST! HIGH JOULE-RATING - CONFORMS TO UL 1449 SAFETY STANDARDS: An integrated 12A circuit breaker protects all outlets and shuts down connected equipment in case of overload. Diagnostic LEDs confirm power, protection and line fault status at a glance. 3330 joules mean maximum protection for your equipment. Conforms to current UL 1449 3rd Edition safety standards. CONVENIENT OPTIONS FOR PLACEMENT IN ANY ENVIRONMENT: 6' AC power cord with NEMA 5-15P plug provides the ability to reach distant outlets. This multi plug outlet offers keyhole slots on bottom panel for convenient wall mounting. 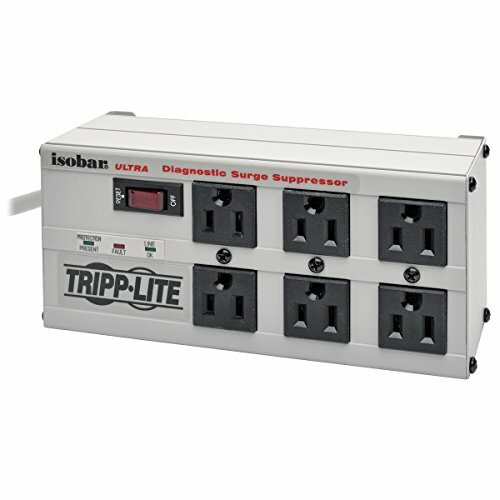 LIFETIME WARRANTY, $50,000 INSURANCE: White surge protector offers lifetime Limited Warranty and $50,000 Ultimate Lifetime Insurance covers any connected equipment damaged by a power surge.